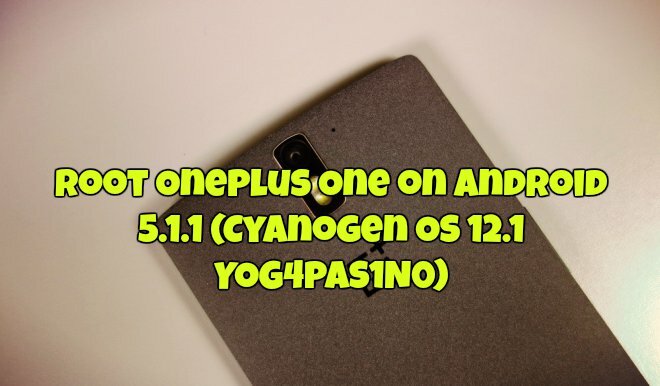 OnePlus team recently released the new official Android 5.1.1 update (Cyanogen OS 12.1 YOG4PAS1N0) for the OnePlus one Android smartphone, and the new update comes with lots of fixes and upgrades. If you recently updated your phone with this latest update and lose the root access on your phone and want to do the same again on your smartphone. Here in this tutorial we’ll show you how to do that. Rooting has lots of benefits, once he phone is rooted you can do changes on your system, install custom ROMS, take the full system backup and lots more. To root the oneplus one first you have to unlock the bootloader, then flash TWRP recovery and in the last flash the Super SU zip file to get the root access. Most of the users who are new to android don’t know must about the process and faced so many problems. But here in this guide we’ll show how to do this easily with the manually method or with the tools. Yes there are so many tools are available on the net which allows you to unlock, Root, and install TWRP on your phone and one of the best is Wugfresh Onceplus One Toolkit. If you want to use this tool then check out our guide here how to use to root the Oneplus one. But we always prefer the manual way, with this way you know which step you missed or what the problem you are facing to root the phone. The process is a little bit lengthy but not so hard. In this process, you need to setup ADB drivers on your windows PC and have to run some commands to unlock the bootloader of the phone and Install TWRP recovery. Once the TWRP is installed all you have to flash one ZIP file with te help of recovery to get he root access on your phone and you are done. Here is the step by step guide to install TWRP and ROOT OnePlus one, read all the instruction very carefully and follow all the steps one by one.